Skills and Abilities: Dr. Wilson is a scientist skilled in various disciplines including engineering, biology, and chemistry; very intelligent and able to decipher alien technologies, can draw accurate conclusions after initial observations; knowledgeable in various other intellectual fields; highly skilled hand to hand combatant and marksman. Equipment:equipped with lightweight set of mechanical wings in the form of a harness, wings are retractable and are controlled through the use of nanotechnology; harness has on board computer connected by neural interface; the harness and wings can recover from light damage through the use of a limited self-repair system; wings have a sharpened edge which Sam uses effectively as a weapon. Doctor Samuel Wilson served in Army, where he met Nick Fury. Upon leaving the military, he was recruited by Nick Fury as a contract Operative for S.H.I.E.L.D. and placed on their payroll. Wilson was allowed to continue his research independently, but reported all important findings to S.H.I.E.L.D.When a strange signal goes out all over the world, S.H.I.E.L.D. investigates. Lead by Fury and assisted by Black Widow and Captain America, the three determine that they need a science guy to help out. Fury specifically thinks of the Falcon, due to his military background. The Falcon is picked up in the Amazon Jungle, where he is doing research with the Shaman in the region, whom he called “Necronauts” because they say they travel among the dead. Falcon, Cap, Black Widow, and Fury locate the signal, and also find out that the X-Men are on the scene, presuming that the signal originated by a mutant. The teams find the true source of the signal; a mechanical being named Vision which the soviets were taking apart and implanting it’s tech onto test subjects. The Vision came to Earth to warn of the impending threat of Gah Lak Tus. 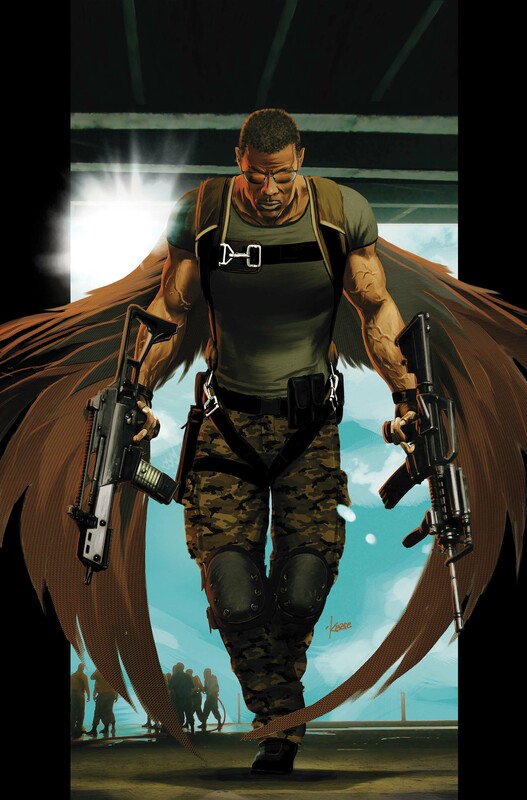 Falcon was assigned by S.H.I.E.L.D. to work with Vision and learn what he could. The Falcon relocated to the Triskelion to work on Vision, and took part in the defense of the base from the Enclave. He first partnered with Captain America to investigate reports of a silver skinned man in Manhattan, which turned out to be the herald of Gah Lak Tus. Afterwards Falcon stayed on working with S.H.I.E.L.D. and partnering with Captain America. He would appear later when Fury ask him to infiltrate Reed Richards’ City of Tomorrow. Even though the Falcon was using new tech that rendered him invisible, Richards was able to detect him. Normally I don’t like Falcon, but this one sounds kind of cool. Was this character only in the “Ultimate Nightmare” series or has he been featured in any other Ultimate books?